B.L. 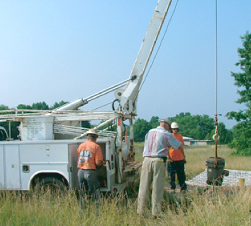 Myers Bros. has a radio dispatched crew on call 24-hours a day, 7-days a week to provide the quality service you desire, whether its a residential, municipal or environmental water well system. Our technicians will diagnose your water system’s problem and repair it. B.L. 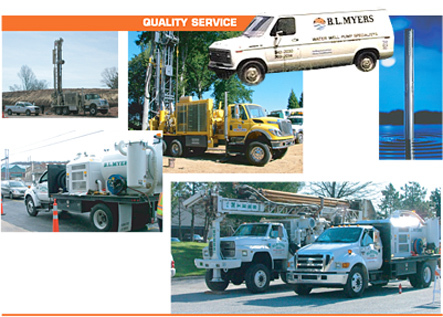 Myers Bros. services all pump brands and water well systems. We install and service submersible pumps, jet pumps, centrifugal pumps, vertical turbine pumps, and submersible turbine pumps and provide other services as listed below. B.L. Myers Bros. is partnering with the world’s largest manufacturer of pumps, Grundfos, who has broken the mold to design a radically new submersible pump that will bring about a whole new era in pumping equipment. 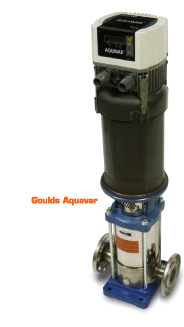 The new SQ Series of submersible pumps. These pumps incorporate many protection and applications features giving B.L. Myers Bros. confidence in their installation with the flexibility to adapt the pump to many different applications. There are two models of the SQ Series of pumps: the standard SQ and the advanced SQE. Both models offer five flow sizes from 5 to 30 gpm and a horsepower range of 1/3 to 1.5 Hp. • Single phase input, 08-0 volt, through 10 HP. • Three phase, 08-0 volt units, through 10 HP. • Three phase, 460 volt, 5 HP, up to 15 HP. • Motor mounted capability to a standard TEFC pump motor. • Multi-Pump control up to 4 Aquavar controlled pumps. Additional panels or starters are NOT required. Connection made via the RS485 on each Aquavar. • Pressure transducer and shielded cable included. • Integral variable frequency drive with pump control logic. Designed exclusively for centrifugal pumps! • Easy programming in pump language. • Motor required is a three phase standard AC induction type. Inverter duty not required. • Pump protection from run-dry, dead-head, cavitation and run-out. • Relay contacts available for PUMP RUN, FAULT LIGHT. • Analog output 0 – 10 Vdc for monitoring system pressure. • Single phase input up to 50 HP* 08-0 volt. • Three phase 08-0 volt input up to 100 HP. • Pump protection built in! Protects based on RUN-DRY, “DEAD-HEADING”, CAVITATION and “OUT” conditions. • Motor protection built in! Protects based on OVERCURRENT, OVER/UNDER VOLTAGE, PHASE LOSS, SHORT CIRCUIT, GROUND FAULT, OVERTEMPERATURE. • Built-in line choke. Similar to a line reactor, it provides the equivalent of 3-5% impedance against transient voltage spikes and surges. reduces harmonic distortion. • EMC/RFI filters reduce drive noise interference and emissions. • Multi-Pump without additional PLC’s or controls. Automatic Lead-lag and alternation up to four (4) Aquavar controlled pumps. • Fieldbus compatible. MODBUS® is standard protocol with SCADA networks. • Fixed speed control relays. 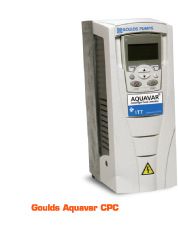 Control up to three fixed speed pumps with one Aquavar CPC with programmable relays (starter panel extra). • Help text and programming “Wizards” to assist with set up. • Pressure transducer with shielded cable included. 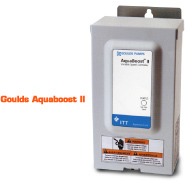 • Compatible with other Aquavar software for multi-pump. • UL, CUL, CE approvals. • NEMA 1 standard design (indoor), with NEMA 1and outdoor enclosures available. • Dual pressure control with programmable differential pressure starting. Packaged system. First generation of small residential type variable speed pump controllers. Sizes up to 3HP (10 Amp), this unit provides constant pressure and speed control to smaller pumps, primarily used for residential markets. Typical system includes the pump/motor, controller, wiring/conduit, Goulds Pumps air diaphragm tank 2gallon, pipe tee, pressure gauge, pipe plugs, pressure transducer and motor thermal sensor. • Single phase input ONLY, 0 volt, ±15% tolerance. • 1, and HP (10 Amp rating). • phase, 0 volt motor required. • Preset for 50 psi at factory. • Field programmable up to 80 psi. • Flows up to 5GPM (AB1). • Ambient temperature 104º F maximum. • Input/output wire with flexible conduit included. • Low suction pressure protection. • Over/under voltage, short circuit, ground fault, overload amps. • Signal lights, pump run, pump fault, pump stopped. Pre-packaged system that includes: pump/motor, pressure tank, pressure transducer, piping tee, pressure gauge, wiring with flexible conduit. Self diagnostic variable speed controller is the next generation of constant pressure. Sold as stand alone unit or with packaged system. • Single phase input voltage ONLY, 08 – 0 volt, ±15% tolerance. • Maximum amperage on motor is 16.6 Amps with 5 HP controller. • Motor must be three phase, 08 – 0 volt, ±10%. • Flows up to 110 GPM, with 5 HP pump. • Pressure factory set for 50 psi. • Field programmable pressure setting up to 80 psi, total system. • Outdoor rated, NEMA r enclosure, rain-tight. • FCC compliant for interference. • Signal lights for pump running, faults, stopped. • Self-diagnostic, plug-in display not needed. • Field setting for booster pumps. • Wall mounted with convection air cooling. • Maximum ambient temperature 104º F.
• Electrical efficiency above 95%. 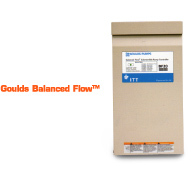 The Balanced Flow™ is a variable speed, constant pressure controller designed exclusively for submersible well pumps! It provides smooth control for residential submersible water systems which typically uses a larger tank and switch. 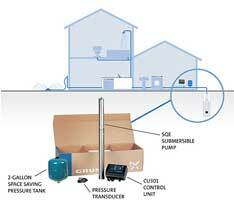 The controller monitors the pressure in the system and adjusts the pump speed to maintain a constant pressure. The Balanced Flow (BF) also monitors the motor current draw, voltage, temperature and loss of pressure.Its design is simple, rugged and made exclusively for the water well market!Turn a conventional system with large tank and switch into a premium constant pressure control system using the Balanced Flow controller. Now with a standard 3 year warranty! • Standard sizes 2 , and 5HP. • Single phase input voltage 08-40 Volt. • R requires phase submersible motor. • reduces motor cable wire size. • More room for easy cable/wire connections. • Outdoor rated painted steel enclosure, NEMA 3R. • Easy to adjust pressure control pushbuttons. • Provides motor protection on long motor leads.